Habit: Biennial or perennial herb 3--100+ cm from rhizome or taproot with thin branched fibrous roots, loosely hairy to glabrous. Stem: 1--several. Leaf: pinnate or generally simple, basal and proximal cauline generally petioled, mid sessile, reduced, distal bract-like. Inflorescence: heads discoid or radiate, in compact or open cyme-like clusters, rarely single; involucre generally bell-shaped (cylindric); main phyllaries generally 8, 13, or 21 in 1 series, reflexed in fruit, green to +- red, linear, glabrous or hairy, subtended by a few reduced outer phyllaries, not black-tipped; receptacle epaleate. Ray Flower: 0--13(21); corolla pale yellow to deep orange-red. Disk Flower: 20--80+; corolla bell-shaped to tubular, lobes 5 erect to recurved, generally yellow (to deep orange-red); style tips truncate. Fruit: cylindric, generally prominently ribbed, glabrous or stiff-hairy; pappus of white minutely barbed bristles. Species In Genus: 64 species: North America, 1--2 in Siberia. Etymology: (J.G. Packer, Canadian botanist, b. 1929) Note: Formerly in Senecio. The common names groundsel, ragwort, and butterweed are applied to species of both Packera and Senecio. Habit: Perennial herb 1.5--3+ dm, from taprooted or branched creeping caudex. 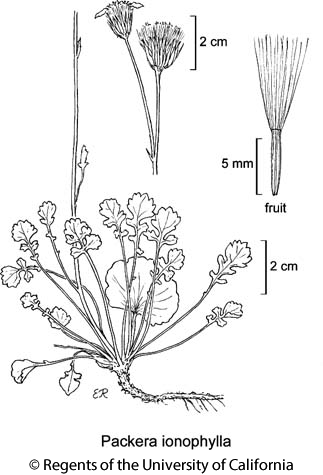 Stem: 1(2--3), cobwebby to woolly-tomentose or becoming glabrous. Leaf: basal and proximal cauline petioled, 1--3 cm, 1--2 cm wide, widely ovate or fiddle-shaped and pinnately lobed, lateral lobes 1--3 pairs, tapered to wedge-shaped at base, ultimate margins +- entire or crenate to coarsely dentate; distal cauline sessile, bract-like, entire. Inflorescence: heads radiate, 3--6; phyllaries (8)13 or 21, 7--10 mm, green, densely tomentose proximally, becoming glabrous distally, tips with tufted hairs. Ray Flower: 8--13; ray 8--10 mm. Disk Flower: 60--75+. Fruit: 2--2.5 mm, glabrous. Chromosomes: 2n=46. Citation for this treatment: Debra K. Trock 2012, Packera ionophylla, in Jepson Flora Project (eds.) Jepson eFlora, http://ucjeps.berkeley.edu/eflora/eflora_display.php?tid=77396, accessed on April 23, 2019.
s SN, SnGb, SnBr. Markers link to CCH specimen records. Yellow markers indicate records that may provide evidence for eFlora range revision or may have georeferencing or identification issues. Purple markers indicate specimens collected from a garden, greenhouse, or other non-wild location.